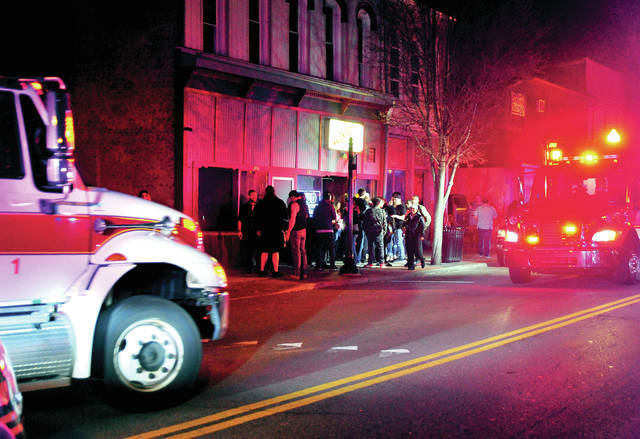 Piqua Police and Miami County Sheriff’s Office deputies work to disperse a crowd as a pair of Piqua Fire Department medics arrive at Lucky’s Bar on South Main Street to treat victims of a Friday night shooting that left three victims wounded. Piqua Police officers and Miami CoUnity Sheriff’s Office deputies search for evidence following a triple shooting in a parking lot near Lucky’s Bar on South Main Street in Piqua on Friday. 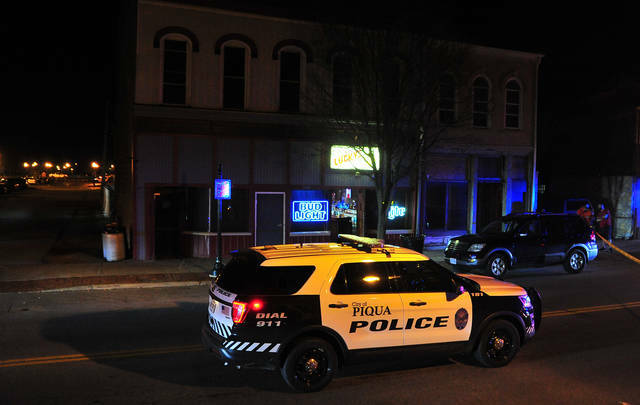 PIQUA — A Friday night shooting near a popular Piqua bar left three victims wounded. 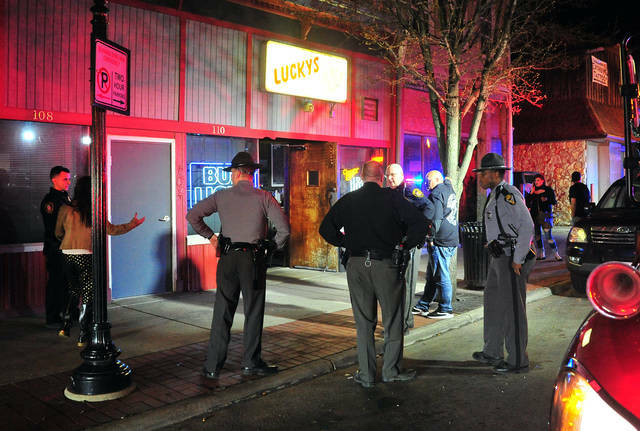 Police were called to Lucky’s Bar around 11:45 p.m. when multiple calls to Miami County 911 reported gunshots fired. Medic units from the Piqua Fire Department were also dispatched, as well as Miami County Sheriff’s Deputies and Ohio State Highway Patrol units. Arriving officers reported at least two gunshot victims and possibly a third. Medics moved in when police gave the “all clear” and treated a trio of victims. One suffered a gunshot wound to the buttocks and another man was shot in the ankle. It is unknown where the third victim was hit. All three were transported to Upper Valley Medical Center for treatment of non-life-threatening injuries, according to Piqua Deputy Police Chief Marty Grove. The shots were all apparently fired in a parking lot just south of Lucky’s Bar. Grove described the area as a “very active crime scene” as officers worked to gather evidence and information late into the night. Police do have a suspect in the case. Witnesses reported that the suspect fled the scene in a dark-colored vehicle following the shooting. That vehicle was located north of Piqua, according to Grove. “We are going to be bring it in and apply for a search warrant,” Grove said. A few new details emerged on Saturday morning. Grove said that the ages of the shooting victims is listed as 28, 25, and 24 years old. The victims names have still not been released but Grove said that officers checked with Upper Valley Medical Center and were told that none of the three are currently listed as patients at the facility on Saturday. The investigation into the shooting incident is continuing. Police are asking that anyone who may have been in the area at the time of the incident, or has any knowledge of what happened, call (937) 615-TIPS.